Liver disease is one of the leading causes of death in long-term survivors after renal transplantation (1, 2). Hepatitis C virus infection is currently the main cause of chronic liver disease in this group (1, 2). Hepatitis C virus (HCV) is a member of the Flaviviridae family, which also includes the classical Flavivirus (yellow fever and dengue virus) and Pestivirus (3). HCV is a small, single-stranded RNA virus, 30 to 36 nm in diameter, with a lipoid envelope. The genome consists of one large open-reading frame of 9379 to 9481 nucleotides. At the 5′ end, there is a terminal region of 329 to 341 nucleotides with 92% homology among different HCV types. This region probably has a function in the translation of the viral genome. Its highly conserved character renders it suitable for diagnostic purposes, i.e., detection of viral nucleic acid with PCR. It has also become a target for the development of nucleic acid-based antiviral agents, such as antisense oligonucleotides and ribozymes (4). Hypervariable domains have been described at the amino terminus of the E2 envelope region. Sequential mutations in this region probably have a role in viral escape from the host immune response (4). There are at least six main genotypes, corresponding to the main branches in the phylogenetic tree, and several subtypes. The types have been numbered 1 to 6 and the subtypes a, b, and c (5). Distinction of HCV genotypes is important, because outcome of HCV disease and response to antiviral therapy with interferon correlates with the HCV type. Genotype I, particularly Ib, has been associated with more severe chronic liver disease and a poor response to interferon therapy. HCV infection is relatively common. Approximately 3% of the world's population is chronically infected with HCV, but there are marked geographical differences (6). HCV infection occurs among people of all ages, but the prevalence is highest among men 20 to 39 yr old (6). HCV accounts for approximately 20% of cases of acute and 70% of chronic hepatitis. Chronic hepatitis C is a major cause of cirrhosis and hepatocellular carcinoma. HCV infection persists in about 80% of cases (7). Moreover, HCV-related end-stage liver disease is the most frequent indication for liver transplantation. The main route of transmission of HCV is parenteral : either intravenous drug abuse or blood products that in the past had not been screened for anti-HCV (7). Other modes of transmission include organ transplantation, tattoos, and needle-stick accidents among healthcare workers (7). Sexual transmission is exceptional in heterosexual relationships, but in homosexuals the risk is high. Finally, there are several reports of nosocomial transmission of HCV, particularly in endoscopy and cardiac surgery units (7). Hemodialysis patients have also been identified as a high-risk group for HCV infection (8). Three categories of assays may be used in the diagnosis of HCV infection : (1) serologic tests, detecting antibodies specifically directed against HCV antigens ; (2) assays detecting and quantifying HCV antigens ; and (3) assays detecting or quantifying HCV genomes and analyzing their sequence (9). Only serologic- and molecular biology-based assays are used routinely for screening and diagnosis. Serologic assays include screening tests based on enzyme immunoassays (EIA), supplemental immunoblots, and serologic assays detecting genotype-specific antibodies (9). Molecular assays include qualitative tests detecting HCV-RNA, quantitative assays measuring the HCV viral load as an index of HCV replication, and tests analyzing the nucleotide sequence of the HCV genome (9). The diagnosis of HCV infection is made by detecting either anti-HCV or HCV-RNA. Anti-HCV is recommended for routine testing in patients with suspected HCV infection, and PCR for confirmation of the presence of active infection. Transaminases are not specific, but may raise suspicion of HCV infection. Nevertheless, 25% of individuals infected with HCV have normal alanine aminotransferase (ALT) (7, 9). Infection with HCV causes not only acute and chronic liver disease, but also extrahepatic manifestations, mainly related to chronic stimulation of the immune system and to virus-induced autoimmunity (10). The spectrum of liver disease is broad, and progression rates are extremely variable. The acute clinical phase of HCV infection has been documented mainly in transfusion-associated cases in which the mean incubation period is 6 to 8 wk (range, 2 to 26 wk). In a minority of cases, acute hepatitis C is symptomatic. As a rule, the clinical course is mild, but approximately 75% of patients develop chronic infection (10). The major problem is chronic persistent or active hepatitis. Pooled data from follow-up studies on patients with non-A, non-B hepatitis who were subsequently diagnosed as having HCV infection showed that 20 to 30% developed cirrhosis (10). Prospective studies indicate that 60 to 90% with ALT abnormalities do progress, while a carrier state develops in 10 to 40% of patients with normal ALT. HCV infection is also associated with hepatocellular carcinoma, but the incidence is probably low, although precise figures are not available. The risk of progression toward cirrhosis is increased in the presence of other risk factors, i.e., coinfection with hepatitis B virus, HIV, or hepatotoxic agents such as alcohol. Chronic HCV infection is associated with the presence of specific cytotoxic T lymphocyte responses and neutralizing anti-envelope antibodies (11). The presence of an active immune response with high levels of anti-HCV antibodies and viral antigens predisposes to extrahepatic manifestations (11). The disease most frequently associated with HCV infection is mixed cryoglobulinemia. HCV infection is the most common cause of mixed cryoglobulinemia (12). The serum cryoglobulins represent HCV/anti-HCV immune complexes associated with rheumatoid factor and complement (12). Although detectable cryoglobulins are common in chronic hepatitis C, it is usually asymptomatic. The clinical syndrome of mixed cryoglobulinemia includes arthralgia, Raynaud's disease, and purpura. Glomerulonephritis (GN) and neuropathy are rare, but may be severe and fatal. Different types of GN have been described in association with HCV infection, particularly membranoproliferative GN, with or without cryoglobulins (13). HCV infection may play a role in some patients with low-grade non-Hodgkin's lymphoma (12). Other associated conditions include porphyria cutanea tarda, Sjögren's syndrome, autoimmune-thyroid disease, lichen ruber planus, panarteritis nodosa, and arthralgia ; however, whether the association is causal remains unclear (12). Until recently, interferon-α was the only therapy available for the treatment of patients with chronic hepatitis C. After 48 wk of treatment, an initial response is seen in about half the patients, but a sustained biochemical and virologic response with histologic improvement occurs in only 15 to 20% of treated patients (14). The introduction of ribavirin, a synthetic guanosine nucleoside analogue with in vitro antiviral activity against a range of RNA and DNA viruses, has changed HCV therapy. Several studies have demonstrated that the efficacy of combined interferon and ribavirin therapy doubles the response rate (15, 16). We predict that combination therapy will become the standard initial therapy for HCV patients, including naïve, non-responders, and relapsing patients. HCV infection is relatively common in dialysis patients (17). The prevalence in dialysis patients depends on the geographical area, but it is always higher than in the general population. In Mediterranean countries (Spain, Italy, Greece, and France), it is usually higher than 20% in dialysis patients (2). In Northern countries (England, Scandinavia, and Holland), the prevalence is much lower, usually less than 5% (2). In the United States, the prevalence is between 10 and 20% (2). Factors that may influence the risk of HCV infection in dialysis patients include the following : (1) the number of blood units transfused ; (2) the length of dialysis therapy ; and (3) the type of renal replacement therapy (2). Blood transfusions have been the main source of HCV infection for many years, but after the introduction of a screening test for blood donors (enzyme-linked immunosorbent assay [ELISA]-HCV), the risk of posttransfusion HCV is less than one case per 100,000 blood units. Duration of renal replacement therapy is clearly related to the risk of developing HCV infection : The prevalence is >80% in patients with more than 20 yr on dialysis (17). Today, the most important factor is the type of replacement therapy. Patients on hemodialysis have a prevalence of HCV infection that is 2 or 3 times greater than in patients on peritoneal dialysis or home hemodialysis (2). Nosocomial transmission of HCV in the dialysis units is probably the main route of HCV infection (18). It is clearly related to the prevalence of HCV infection in the respective dialysis units and reaches 3 to 5% per year in units with a prevalence of >20% (19). Dedicated machines and an adequate nursing staff are mandatory in units with a high prevalence. In Western European countries, the complete isolation of HCV-positive patients in such units has helped to lower the rate of new cases (nosocomial infection) to virtually zero (20). In our opinion, such policies are advised in units with a prevalence of >10%. The diagnostic methods used to detect HCV infection in dialysis patients are similar to those used in the general population (21). Transminases are not specific, but may help raise suspicion. Liver enzymes are usually lower in dialysis patients ; therefore, even an increase of ALT within the normal range of values raises suspicion of HCV infection (2, 21). The third-generation EIA test is suitable for screening, with a sensitivity and specificity similar to that in the general population, i.e., 95% (22). Recombinant immunoblot assay and more precise PCR (HCV-RNA) are confirmatory (21). There is some controversy concerning the prevalence of a negative EIA test in the presence of a positive PCR test (23). In studies with third-generation EIA, the percentage is <1%. The diagnosis is made based on a positive EIA test, and PCR confirms active HCV infection. Genotyping and viral load (quantitative PCR) are research procedures suitable for evaluating the efficacy of the treatment. The long-term outcome of dialysis patients has improved markedly, but longer survival rates likely will mean more frequent cases of HCV liver disease. In dialysis patients, different types of chronic hepatitis, including liver cirrhosis, are found (24), but the main problem is cardiovascular mortality (25). 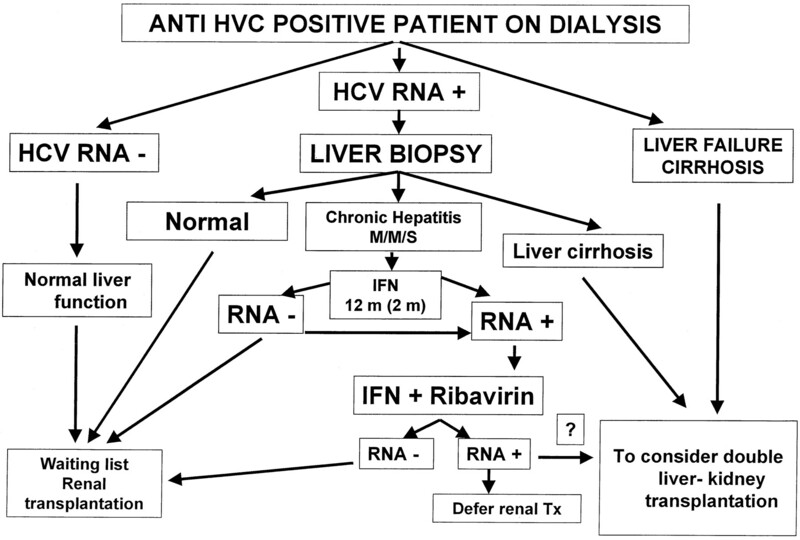 HCV disease is a major problem after renal transplantation (1, 2, 21). Immunosuppression facilitates HCV replication, thus aggravating liver lesions (26,27,28). After renal transplantation, the viral load increases 5 to 10 times, ALT increases, and the percentage of HCV patients with normal ALT decreases significantly (26,27,28). Therefore, preemptive treatment of HCV infection in the dialysis period to achieve negative HCV-RNA is imperative before transplantation, because after renal transplantation interferon is contraindicated because of the risk of acute rejection. The management of HCV infection in dialysis patients on the waiting list has not been completely standardized. Morbidity and mortality from HCV infection after renal transplantation are marked, affecting patient and graft survival. Two aspects of HCV infection should be evaluated : its severity and options for treatment. In the evaluation of HCV infection, liver tests, liver biopsy, and virologic tests are helpful. Transaminases (ALT and aspartate aminotransferase) are helpful, but are not suitable for defining the severity of the hepatic lesion. Determination of hematologic and coagulation parameters and potentially an upper digestive endoscopy are recommended procedures. Liver biopsy represents the gold standard for defining the severity of liver involvement. Unfortunately, no other test provides this information. In the past, the risk of hemorrhage in dialysis patients limited the use of conventional liver biopsy, but this risk is lessened with the transjugular technique, which gives valuable information on portal pressures. We believe that liver biopsy is mandatory in the transplant candidate. Virologic tests include the EIA test, recombinant immunoblot assay test, PCR technique (HCV-RNA), viral load, and genotypes. After making the diagnosis with an EIA test, a positive PCR (HCV-RNA) is necessary to confirm the presence of active infection. PCR may be negative in patients with low viral load or in the healing pahse of HCV infection. Before one accepts that HCV-RNA has become negative, two separate PCR are recommended because of frequent variations in viral load. The determination of viral load and genotypes is limited to research purposes, although the former is helpful in the management of interferon therapy. Several reports on interferon therapy in dialysis patients confirmed that the rate of response of interferon is higher than in the general population. The rate of development of a negative RNA test is approximately 50%, and in most cases the response is sustained (29). The evolution of liver disease after renal transplantation is better in patients who had interferon treatment before renal transplantation than in patients without treatment (30). It is not understood why the response to interferon is better in dialysis patients, but two points deserve consideration : (1) Duration and severity of HCV infection are probably lower in dialysis patients. (2) Interferon accumulates in dialysis patients so that a significantly higher area under the curve is achieved (31). There are only four reports on the use of ribavirin in dialysis patients. In pilot studies, severe hemolytic anemia occurred on ribavirin therapy, limiting its use, at least unless safe dose adjustment has been worked out. Our current policy for renal transplantation candidates on dialysis with HCV infection is depicted in Figure 1. The indication for interferon treatment is based on liver histology (32). Patients with chronic hepatitis receive interferon monotherapy. In patients with severe chronic hepatitis, a second liver biopsy could be required before entry on the waiting list. Patients with normal liver histology are included on the waiting list without having received antiviral therapy. Patients with liver cirrhosis are considered for simultaneous liver and kidney transplantation. The dose of interferon is 3 million units daily for 1 to 2 mo, if tolerated, followed by 3 million units 3 d a week (after hemodialysis) to complete a total of 12 mo of therapy. If the PCR remains positive after 3 mo of therapy, interferon is discontinued. Ribavirin therapy in combination with interferon is considered only in relapsing patients and non-responders. Management of hepatitis C virus (HCV) infection in dialysis patients on the waiting list for renal transplantation. Most HCV-positive graft recipients acquired the infection on dialysis (2), but alternative possibilities include preoperative transfusions (33) and organ transplantation (2, 21, 33). The prevalence of anti-HCV antibodies by ELISA2 varies between 10 and 49% (2, 21, 33), depending on center, country, race, geographic origin of the recipient, mode of dialysis therapy (hemodialysis versus peritoneal dialysis), time on dialysis, number of blood transfusions, retransplantation, presence of anti-hepatitis B core antigen, and history of intravenous drug abuse (2, 21, 33). Between 20 and 60% of the ELISA2-positive patients have chronic liver disease, defined as elevated serum transaminases for more than 6 mo (34, 35). Presence of anti-HCV antibodies before transplantation carries an increased risk of liver disease after transplantation (21). Most ELISA2-positive patients (70 to 95%) have detectable HCV-RNA (33,34,35). This viremic state persists in almost all transplanted patients. In patients with HCV-RNA before transplantation, viral titers increased 1.8 to 30.3-fold after transplantation, suggesting increased virus replication. HCV-RNA titers do not differ between patients with or without posttransplant liver disease (21). Third-generation assays of HCV antibodies in renal transplant patients are more sensitive and specific than second-generation assays, but are less sensitive than PCR-based assays (35). Whether the course of infection and liver disease after renal transplantation differs according to virus genotype is unclear. No difference of ALT was found between patients infected with different genotypes (36). In the Mediterranean area, the most frequent genotype is 1b (35), which is related to severe forms of liver disease. Nevertheless, the clinical course of chronic liver disease after transplantation in the Mediterranean area seems to be similar to that in other parts of the world (33). Except in patients with fibrosing cholestatic hepatitis (37), the initial course of liver disease after transplantation is generally benign (38). In the long-term, however, patients with HCV infection frequently develop abnormal liver function tests and liver histology compared with HCV-negative patients (2, 21, 33, 35). Nevertheless, in 20 to 51%, ALT levels remain normal despite detectable HCV-RNA (33). Unfortunately, this does not indicate that liver disease is absent. The poor correlation between ALT levels, titers of HCV-RNA, and liver histology is well known (33). Also, a “healthy” carrier state, defined as normal ALT levels, positive HCV-RNA, and normal liver biopsy, can be observed in approximately 10% of HCV-positive patients (39). The risk of developing chronic liver disease after renal transplantation is mainly related to the duration and severity of pretransplant liver disease, the histopathologic findings, the presence of anti-hepatitis B core antigen, the time after transplantation, and the type and degree of immunosuppression (21, 33, 35). Patients who receive antilymphocyte preparations (OKT3, antilymphocyte globulin and antithymocyte globulin) are more likely to have liver disease (21). Because there is no relation between ALT levels, HVC-RNA titers, and severity of liver disease (33), liver biopsy is required for a diagnosis, for establishing a prognosis (40), and for potentially initiating therapy. Some centers, e.g., the Hôpital Necker in Paris, perform periodic liver biopsies to adapt immunosuppression (41). Biopsies in selected patients with chronic elevation of ALT documented severe liver disease, e.g., chronic active hepatitis or cirrhosis, in up to 20% of HCV-positive transplant recipients (33). The prevalence was less when biopsies were performed in all HCV-positive patients, regardless of ALT levels (33). Glicklich and Kapoian (42) reported on 164 liver biopsies in HCV-positive patients : Minimal changes were found in 15%, persistent chronic hepatitis in 37%, chronic active hepatitis in 34%, cirrhosis in 7%, and other findings in 4%, suggesting that chronic hepatitis is common and cirrhosis infrequent. The critical point is that liver biopsies were performed soon after transplantation. It probably takes up to 20 to 30 yr for cirrhosis to develop (33). Repeated biopsies show progression of liver disease in a substantial proportion of patients (35, 40). In 11 of our 15 HCV-RNA-positive patients with chronic liver disease who had repeated biopsies, liver disease progressed. Three patients had developed cirrhosis within 24 to 144 mo. In eight patients with active chronic hepatitis, the Knodell index deteriorated within 36 to 120 mo ; these patients had received more antirejection therapy than patients with stable liver disease (35). So far, isolated cases of hepatocellular carcinoma have only been reported from Taiwan (43), but not from other parts of the world. This may be due to differences in the duration of disease (more than 20 yr are required for hepatocellular carcinoma to develop). Because of the risk of carcinoma, ultrasonography and α-fetoprotein concentrations should be monitored frequently in patients with cirrhosis (33). Patients with hepatitis B and hepatitis C coinfection have more aggressive liver disease than patients with HCV infection only (33, 35). Measures to prevent hepatitis B are therefore indicated in HCV patients. Fibrosing cholestatic hepatitis (FCH) is a rare but serious form of liver disease in hepatitis B patients (44). Recently, it has also been described in liver, heart, or renal transplant recipients with hepatitis C infection (33, 35, 37). It is characterized by cholestasis with only mild-to-moderate elevation of aminotransferase levels and fast deterioration of liver function ending rapidly in hepatic failure. Histology shows ballooning and histologic signs of cholestasis (35, 37). Whenever a cholestatic pattern with rapid deterioration of liver function develops in an HCV-positive patient, liver biopsy should be performed immediately (45). Only a few HCV-positive patients with FCH have been observed after renal transplantation. We published four cases, two of which had fatal liver failure 22 and 49 mo after transplantation. One patient with hepatic failure received a liver transplant, and the fourth is alive on dialysis awaiting a combined kidney and liver transplant. Interestingly, all had received azathioprine, but not aggressive immunosuppression. None had received interferon therapy (37). A recent report suggests that early interferon therapy and discontinuation of azathioprine lead to rapid normalization of liver tests. A combination if interferon and/or ribavirin with discontinuation of azathioprine and reduction of the doses of immunosuppressive drugs has also been proposed, once the diagnosis of FCH has been established by liver biopsy (45). FCH can appear as late as 10 yr after transplantation. The pathogenesis of FCH is not well known. Some authors suggest a direct hepatocytopathic effect of HCV when immunosuppression permits high intrahepatic expression of the virus. An ancillary role of azathioprine is possible (46), since some patients had lesions suggestive of azathioprine-induced liver disease. The aim of treatment in HCV-positive patients after transplantation is to avoid the development of cirrhosis and extrahepatic complications such as GN. In nontransplanted patients, interferon and ribavirin is currently the best combination, yielding a high rate of viral clearance and improvement of liver histology (15). In transplanted patients, pilot studies with interferon-α (Table 1) showed poor tolerance, limited efficacy (sustained virologic response was not observed), and definite risk of rejection and/or renal failure that occasionally was irreversible (in some series, observed in >50% of patients) (47,48,49,50,51,52,53). Consequently, this treatment cannot be recommended (50). The only accepted indication for interferon therapy after renal transplantation is fibrosing cholestatic hepatitis (45). The experience with ribavirin in transplanted patients is limited. In one study, seven stable renal transplant patients received 400 to 800 mg/d for 6 mo. The efficacy was limited, since only two patients became HCV-RNA-negative and only four had normalization of liver enzymes. Hemolytic anemia was the principal side effect (54). There is no experience with the combination of interferon and ribavirin. Based on one recent study, amantadine may be useful in HCV-RNA patients with normal renal function (55). It enhances the efficacy of interferon and ribavirin, and results were encouraging with no renal and hematologic toxicity (L. Rostaing, personal communication). Because there is no uniformly effective therapy in renal transplant patients, the best strategy is to treat HCV-positive patients on dialysis before transplantation, as discussed above. HCV infection may be associated with several immune-mediated disorders (12), especially type I membranoproliferative GN (MPGN) with or without cryoglobulinemia and, less frequently, membranous GN (MGN) (13). These lesions may appear in HCV-RNA-positive patients without severe liver disease. They may affect native kidneys (56) or renal allografts (Table 2) (57, 58). MPGN has also been observed after liver transplantation. (57). Anti-HCV antibodies before renal transplantation are apparently a risk factor for the appearance of proteinuria with poor outcome, suggesting that HCV may cause glomerular lesions (59). MPGN with cryoglobulinemia has been reported in renal transplant patients with anti-HCV antibodies who exhibited proteinuria and microhematuria, positive cryoglobulins (type II, IgG polyclonal-IgMk monoclonal), low serum levels of immune complexes, hypocomplementemia (C3 and C4), antinuclear antibodies, and antineutrophil cytoplasmic antibodies with a perinuclear staining pattern. In one series in which all patients with HCV viremia had the genotype 1b, the concentration of HCV-RNA was higher in cryoprecipitates than in serum (60). De novo MPGN without cryoglobulinemia has also been described in HCV patients after renal transplantation (61,62). In one series, the proportion of patients who developed MPGN was higher in HCV-positive (7 of 115 ; 5.9%) than in HCV-negative recipients (8 of 282 ; 2.8%) (63). We observed 15 patients with MGN in HCV-positive graft recipients. Histology resembled idiopathic MGN, except for the presence of interstitial and vascular lesions due to chronic rejection. Patients presented with nephrotic proteinuria without cryoglobulinemia, hypocomplemetemia, or rheumatoid factor. The clinical course was similar to idiopathic de novo MGN posttransplantation. The prevalence of MGN was higher in HCV-positive (15 of 409 ; 3.6%) than in HCV-negative patients (6 of 1636 ; 0.36%) (64). HCV infection may also be associated with de novo thrombotic microangiopathy in the graft and with anticardiolipin antibodies (65). This complication was observed soon after transplantation and often was fatal. This newly recognized association may have important clinical implications. The pathogenesis of MPGN and MGN in HCV-positive graft recipients involves deposition of HCV-containing immune complexes that may seem paradoxical in immunosuppressed patients. A potential relation between HCV-associated GN and transplant glomerulopathy has also been reported (57, 58). There is no specific therapy for HCV-related GN after renal transplantation (57). Interferon in nontransplanted patients can reduce proteinuria, suppress viremia, and improve liver function tests (56), but interferon induced acute rejection or renal failure in graft recipients. It can also exacerbate proteinuria and GN in HCV-positive renal transplant recipients (66). Information on ribavirin in this indication is not available. Four liver graft recipients were effectively treated for an HCV-associated nephrotic syndrome (67). It may therefore be useful in renal transplant patients as well. In 1981 it was reported that patients with non-A non-B hepatitis had “a marked increase of life-threatening extrahepatic infections” (2). This finding has been corroborated in HCV-positive patients who had more frequent postoperative infections and potentially fatal infections of the central nervous system, lungs, and blood stream (cytomegalovirus, tuberculosis, sepsis, and Pneumocystis carinii) (35, 68). Infections are enhanced by heavy immunosuppression. Therefore, in HCV-positive patients, administration of immunosuppression should be reduced to the lowest possible levels, and close monitoring for infections is mandatory. The incidence of acute rejection in HCV-positive patients is a controversial issue. Some, but not all, authors found a higher frequency of acute rejection in HCV-positive patients compared with HCV-negative patients (33, 35). In our experience, this rate is significantly lower (28% in HCV-positive versus 40% in HCV-negative patients ; P < 0.025) despite a significantly higher proportion of patients immunologically at high risk (30.5% versus 11.8%) (69). This may be explained by reduction of naïve T helper cells in HCV-positive patients, in association with altered T cell-proliferative responses to mitogens. The combination of a low incidence of acute rejection and a high prevalence of infections may be explained by the immunodeficiency state in HCV infection. Whether HCV infection after renal transplantation adversely affects graft and patient survival remains controversial. Most series reported no impact on long-term patient and graft survival (33, 35), whereas others showed significantly lower patient survival (70, 71). The differences may be explained by confounding factors, e.g., differences in immunosuppressive protocols, and design and methodology to diagnose HCV infection. In a case-control study by Mathurin et al. (71), 216 HCV-positive recipients were matched with 216 control subjects, i.e., HCV-negative recipients. Ten-year graft and patient survival rates were significantly lower in HCV-positive patients (49.5% versus 69%, P < 0.01) and 65.5% versus 85.3%, P < 0.001). HCV, biopsy-proven cirrhosis, and age were independent prognostic factors of 10-yr survival in renal transplant patients. Twenty-one percent of deaths were due to liver disease in HCV-positive patients. In patients with liver biopsies, patient survival in those with cirrhosis was not different at 5 yr, but definitely lower at 10 yr compared to patients with little fibrosis (85% versus 77% and 26% versus 62%, P < 0.05). Similarly, in the series at the Hôpital Necker, HCV infection did not adversely affect 5-yr survival (41), but after longer follow-up survival was lower (27). Low patient survival rates in recent French (27, 71), Italian (72), and Japanese (53) studies are probably explained by liver disease and sepsis. The mortality rate increased progressively ; it was 10% at 10 yr and 20% at 20 yr. Pereira et al. reported a very high mortality after renal transplantation compared with HCV-negative patients (26, 73). A role for heavy immunosuppression is suggested by the observation that quadruple therapy with monoclonal or polyclonal antibodies was associated with more frequent instances of liver disease (74, 75). Although comparative studies using different immunosuppressive protocols are not available, current information regarding survival figures (27, 33, 35), incidence of acute rejection (33, 35), and infectious complications (68) suggests that immunosuppression should be adjusted depending on liver histology. The lower graft survival in HCV-positive patients may reflect lower patient survival and the presence of HCV-associated GN in the graft. Although long-term survival rates are lower in HCV-positive compared with HCV-negative graft recipients, kidney transplantation still remains the best option for HCV-positive patients with end-stage renal disease, since survival, even short-term, would be substantially lower on the waiting list because of the high cardiovascular mortality on dialysis (25, 73). The data of the New England Organ Bank clearly show that HCV infection can be transmitted by organ transplantation (74, 75). Transmission of infection was 100% for organs from HCV-RNA-positive donors, and 50% of infected patients developed chronic liver disease. After this observation, several organ procurement organizations recommended discarding all HCV-infected kidneys, but this policy has remained controversial, because there are also studies to the contrary (76,77,78,79). The data of the Midwest Organ Bank confirmed the above findings (80), however, other studies showed that transmission of HCV by transplanted organs and posttransplant liver disease were uncommon (77, 79). Other data document that when organs of PCR-positive donors are used, the rate of transmission was 56%, but the frequency of liver disease was not different from control graft recipients (78). Some authors proposed that HCV-positive kidneys could be accepted for HCV-negative recipients. After 4 yr of follow-up, the prevalence of liver disease was higher among patients who had received HCV-positive kidneys, but survival was not altered (81). In contrast, when HCV-negative problematic patients with a limited life expectancy received HCV-positive kidneys, survival was significantly lower when compared with recipients of kidneys from anti-HCV-negative donors (21). The heterogenicity of data on the rate of transmission has not been well explained, but the virus load in the organ donor and the infectivity of the HCV strain could be part of the explanation. Undoubtedly, renal transplant recipients who receive kidneys from HCV-positive donors have a higher risk of liver disease, including fulminant hepatitis and presumably also fibrosing cholestatic hepatitis. According to current information, the majority opinion is that HCV-positive kidneys should not be transplanted into HCV-negative recipients. In fact, in Europe this is prohibited. Unfortunately, a completely restrictive policy of discarding kidneys from HCV-positive donors will add to the problem of organ shortage (76, 82, 83). As a compromise, some authors have suggested that kidneys from HCV-positive donors should be transplanted into HCV-positive recipients (83, 84). In 1990 we introduced the policy of accepting kidneys from HCV-positive donors for HCV-positive recipients (85). The Spanish Transplant Organization supported this policy (86). The results of our prospective study showed no difference in the posttransplantation prevalence of liver disease (32% versus 56%, respectively) or in the survival rates in 24 anti-HCV-positive recipients who received kidneys from anti-HCV-positive donors compared to 40 anti-HCV-positive recipients of kidneys from HCV-negative donors (87). These results are in agreement with retrospective studies (81, 88) and indicate that transplantation of kidneys from anti-HCV-positive donors into HCV-positive recipients is relatively safe, at least for a period of 5 yr (88). In our study, four of five anti-HCV-positive, but HCV-RNA-negative, patients received kidneys from HCV-RNA-positive donors and four tested positive for HCV-RNA after transplantation. Consequently, HCV-positive kidneys should be transplanted into HCV-RNA-positive recipients only (87). The problem still remains that superinfection with a new genotype is possible in this constellation (89), although shortterm follow-up showed no serious clinical sequelae. Matching donors and recipients for HCV genotype would be desirable to minimize the risk of superinfection, and this would require that dialysis patients on the waiting list be tested for HCV-RNA and genotype. Initial results at 25 mo with this policy of transplanting kidneys from HCV-positive donors into HCV-RNA-positive recipients showed no differences in liver disease or in survival figures compared with HCV-positive recipients having received kidneys of HCV-negative donors, i.e., elevated ALT 23% versus 13%, graft survival 80% versus 79%, and patient survival 96% versus 98%, respectively (90). Pereira and Levey analyzed the impact of policies concerning HCV-positive donors in the United States. If HCV-positive kidneys are restricted to anti-HCV-positive recipients, organ loss would be 0%, the transmission rate 2.4%, and the rate of infections 0.5%. If HCV-positive kidneys are transplanted into HCV-RNA-positive recipients only, the figures would be 0, 2.4, and 0%, respectively. Pereira concluded that the latter policy is “the best alternative” (21). In Spain, kidneys from HCV-positive donors are transplanted into HCV-positive recipients only. Long-term experience with this policy shows that liver disease and graft and patient survival are not different in these patients compared with HCV-positive recipients who received organs from HCV-negative donors (Table 3) (91). This policy is therefore safe and avoids loss of kidneys for transplantation. In fact, in the past 10 yr nearly 3800 and 300 HCV-positive kidneys were retrieved in the United States and Spain, respectively. This represents a considerable percentage of kidneys (2 to 3%) that would be “saved” if our policy were universally applied. Obviously, a full explanation about the possible risk of superinfection with different HCV genotypes must be given to the recipients, and they must provide informed consent. New approaches to rapidly identify HCV genotypes in donors and to match donors and recipients would be desirable. HCV infection is a significant problem in the patient with end-stage renal disease. Nosocomial transmission of HCV in the dialysis unit is a risk factor for HCV infection. Dedicated machines and a larger nursing staff are mandatory in units with a high prevalence of HCV infection. HCV-positive patients should be tested for HCV-RNA to document ongoing infection. Management of HCV-RNA-positive patients on the waiting list includes biopsy to provide interferon treatment if chronic hepatitis is present. After transplantation, liver disease is more frequent in HCV-positive patients than in HCV-negative patients. In the long run, this leads to significant liver complications. The patients have a higher risk of developing proteinuria and infections. Long-term patient and graft survival rates are lower than in HCV-negative graft recipients. Mortality is higher mainly as a result of liver disease and infections. Nevertheless, transplantation is the best option for the HCV-positive patient with end-stage renal disease. Transplantation of HCV-positive kidneys should be offered to HCV-positive recipients in whom HCV-RNA is detected in the serum. Finally, several measures taken after transplantation minimize the consequences of HCV infection. Adjustment of immunosuppression and careful follow-up for early detection of proteinuria, infection, and worsening of liver disease are mandatory (Table 4).